How many bad reviews does it take to deter shoppers? Between one and three bad online reviews would be enough to deter the majority (67%) of shoppers from purchasing a product or service, according to a Lightspeed Research study. The study also finds that the majority of consumers used the internet for some kind of product research before making a purchase online or offline in the last six months. Just 13% of respondents didn’t use the internet as part of the purchase process. The research found that price comparison was the most popular research activity for UK consumers, but also highlights the power of reviews, with 61% reading online reviews of products and services. The significance of reviews varies depending on the product type. For example, in the case of personal technology items like MP3 Players and digital cameras, 64% would read product reviews online, while 38% would look for reviews of the retailer they are considering buying the item from. If purchasing a car, 55% would read review of makes and models online, while 34% would look for others’ opinions about car dealers. Where do consumers look for reviews? 72% said they looked for product reviews on shopping websites, which highlights the importance of reviews for retailers, 70% head for a search engine to find reviews. 47% look for reviews on company websites, and 43% on price comparison sites. Which reviews are most reliable? Shoppers find the opinions of other consumers most trustworthy when conducting product research online. 64% said they trusted product reviews from other consumers, 28% were neutral, while just 8% find them to be unreliable. Next came reviews from Which?, trusted by 60% of respondents, followed by professional reviewers (58%) and friends and family (51%). Which types of reviews are most important? 69% believe it is important that a product has good reviews from other consumers, while opinions from friends and family, professional reviewers and Which? were important for 57%. How many bad reviews does it take to deter consumers? This is an interesting one. Between one and three bad reviews will deter the majority (67%) of consumers from purchasing a particular product or service. The tolerance of bad reviews varies depending on age groups. For example, 28% of the 45-54 age group and 33% of 55-64 year olds would be deterred after reading two bad reviews, compared with just 10% of 18 to 24s. I think the context is important here though. When researching products online, I look for a general consensus which you can get when there are a decent number of product reviews. For example, this digital camera on Amazon has three (very) negative reviews, but these reviewers are in the minority, since there are 29 positive reviews, and a very healthy average score. Would the three bad reviews be enough to deter buyers? Perhaps, but the fact that these reviews are placed in context by Amazon means they may not be so off-putting, and also make the positive reviews more credible. Waitrose’s redesign: where did it go wrong? Waitrose relaunched its online shopping service recently, and this prompted a hail of complaints on its own discussion board and several column inches of negative publicity in newspapers and blogs. The list of complaints ranges from performance speed to pure usability issues. Implementing change to an existing service can be difficult so we decided to test the new site with some potential users to see if this was a case of people reacting badly to something new, or whether indeed there was valid reason for concern. 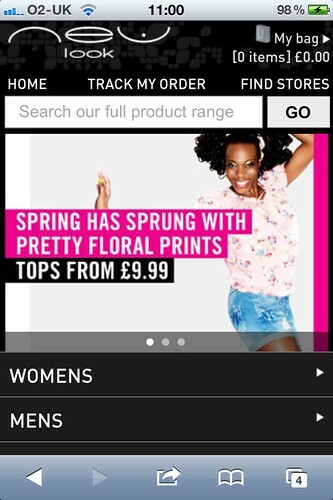 New Look is the latest UK retailer to get into the mobile commerce market, with the launch of a site last week. According to the recent IAB and PwC study, in 2010 display grew by 27% and search by 8%. If you have been following the growth of display and the rise of DSPs (demand-side platforms) you are no doubt aware that growth has been fuelled by RTB (real-time bidding). Its growth and similarities are closely aligned to ‘traditional’ search bid management techniques. This is great news for the display industry and highlights great opportunities for the search marketer. However, are search marketers grasping this opportunity, and do marketers and agencies really understand the new display environment?